Una Mamma Italiana: THE MAMMA MEETS THE CUCINA - Veggie Challenge! THE MAMMA MEETS THE CUCINA - Veggie Challenge! Well, another Mamma Meets the Cucina battle was long overdue. This time we're dueling with veggies. Cast your vote for your favorite side dish! 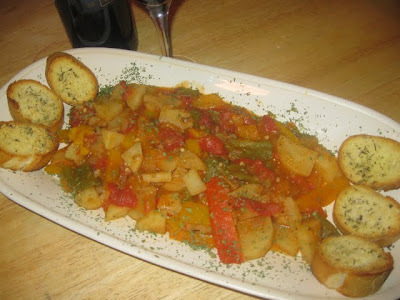 Peperonata, in my opinion, is the perfect Italian vegetable dish. The classic combination of onions, garlic and peppers sautéed in olive oil makes for the beautiful fragrance. The potatoes and tomatoes help give a nice, hearty texture to the dish. And the splash of white balsamic adds the delicious, slightly sweet, slightly tart finish. Whether you're serving it as a side dish, as an appetizer or as a meal itself, the hearty and rustic peperonata is a stick-to-your-ribs kind of meal that you will enjoy time and time again. Many of the recipes that I have found use either fresh tomatoes or canned crushed tomatoes, with the addition of some water or broth to keep the peperonata from drying out. I actually prefer to use canned stewed tomatoes and their juices. The stewed tomatoes are already seasoned, they are soft enough where they will meld nicely with the softened peppers and the remaining ingredients, and the juice is plenty to keep this dish thick but moist (you don't want a soupy consistency). Be sure to use a variety of bell peppers. The variety of pepper colors make for a very appealing presentation. And don't forget the crusty bread for dipping and scooping! In a large pot saute the onions in olive oil on medium-high heat, and when it is completely softened, and before it starts browning, add the garlic. 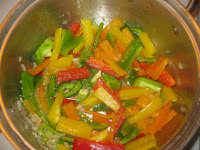 Saute for an additional couple of minutes, then add the peppers, lower the heat to medium-low and stir well. Partially cover with a lid and let them soften up, about 10 minutes. When the peppers have settled into the pan, add the stewed tomatoes and the potatoes. Season the mixture with salt and pepper to taste and the Italian seasoning, stir well over medium-low heat. Add the white balsamic, stir again, cover, cook on medium-low for about 1-1/2 hours or until potatoes are cooked to preference, stirring occasionally. Serve on a platter with crusty or toasted Italian bread. Zucchini is one of my favorite veggies - especially this time of year. I can remember my Grandma Rose picking the zucchini from her backyard garden, stuffing the flowers with ricotta and baking them. It was such a special treat that I loved when I was a kid. I figured that in an attempt to mimic my Grandma's recipe I could risk shaming the family, so I opted for fritters instead! Fritters are a fun and easy way to incorporate veggies into a diet - especially for picky little ones. It's fun for kids to mix up a batter and watch them fry up. I made my daughter part of the whole process and she loved the final result twice as much because of it! Presented with a small slice of fresh lemon and parsley, these become a simple yet elegant side dish. They're like a good pair of jeans - you can dress 'em up or dress 'em down and they always look great. Before combining all the ingredients, pat the grated onion and zucchini dry with a paper towel. This will remove any excess moisture that might make the batter too wet. Then combine all the remaining ingredients (except for the e.v.o.o.) with a spoon. Season with salt and pepper. Drain on a paper towel lined plate and serve hot or warm. Don't forget to cast your votes on either the Una Mamma blog or the Cucina Domenico website. And be sure to 'like' the Cucina Domenico group page on Face Book! Salud! FRIDAY FIVE! - An Italian Mojito!